Perfect primer to give ceramic surface skin! That Gal! This is a primer. It said to give ceramic surface skin however it's hard to achieve from this so don’t really expect to have a ceramic texture skin. The function lacks when it said to be a primer or might be too much. It helps to brighten up the skin and persistency of the makeup increases. Also helps the morning makeup to settle nicely. However the coverage lacks on covering the moles and other marks on the face. I thought it might be a balm type but the texture is kind of liquid lotion type so absorbs well. So that might be the reason why it lacks on the covering. I don't really recommend inexpensive primers because it don’t settle properly on the face. However this doesn’t, it settles smoothly. It said to be some glitters but there aren’t. The smell is really delicious and I use this instead of Mac strobe because it’s really light and moisturizing. The texture is really smooth and very moisturizing. The amount is too little compare to the price. Use before or after foundation. For me after I applied foundation all over my face, I put on top of the cheekbones or can mix with the foundation. However it’s lighter than High beam so gets cover by the foundation, which I don't like. 1. For people who was satisfy with the coverage by Mac strobe would be satisfy with this! Without a base applying sunblock and this and concealer on top of that foundation giving moisturizing skin. 2. People who have a lot of blotches to cover won't work that great. 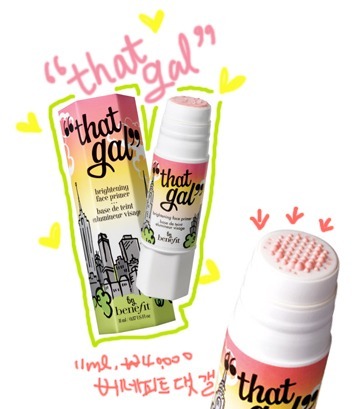 Dry skin type people will be satisfied with this primer That Gal! 3. If the holes of the moles are too large I don't recommend on purchasing this product.